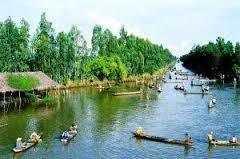 Vinh Long is a province located in the Mekong River Delta of southern Vietnam. Its capital is Vinh Long. Its population is 1.023.400 and its area is 1.475 km2. 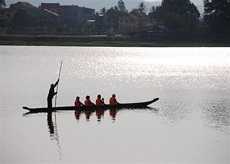 Vinh Long is located approximately 135 km southwest of Saigon, Vinh Long is easily accessible by bus, van or car using National Road 1A and the My Thuan Bridge. 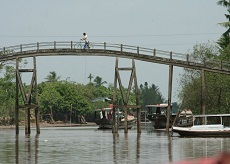 Lying between the Hau and Tien Rivers in the center of the Mekong Delta, Vinh Long is a province well known for fishing. Prawns and the Basa and Tra catfish are among the many types of fish that exist in abundance in the waters of Vinh Long. Its rich, fertile soil makes Vinh Long an ideal location for the growing of many exotic and delicious fruits, including the strange-looking mangosteen, the spikey rambutan and the pungently fragrant durian. 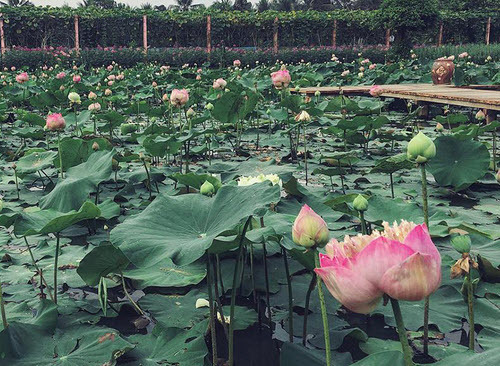 Because of Vinh Long’s extensive network of waterways, these fruits and many other items can be purchased for mere pennies from the huge water-based squadron of floating merchants. Traveling by water is a common practice here for such mundane tasks as grocery shopping as well as getting to restaurants and tourist attractions located on small islets accessible only by boat. Tourist infrastructure is still in its infancy here, but comfortable lodging and great food can be had for very reasonable prices. 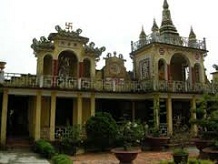 Modern-day Vinh Long was part of Long Ho dinh established by the Nguyen Lords in 1732, comprising the provinces of Ben Tre, Tra Vinh, and parts of Can Tho. The area saw some of the heaviest fighting between the Tay Son brothers and the Nguyen Lords in the late 18th century, in 1784 Nguyen Hue defeated Siamese forces aiding Nguyen Anh at the Mang Thit River. In 1951, the Southern Resistance Administrative Committee of the newly-declared Democratic Republic of Vietnam (North Vietnam) merged Vinh Long and Tra Vinh provinces into Vinh Tra Province. Vinh Tra Province existed until 1954. In 1957, the government of the Republic of Vietnam formed Vinh Long province, consisting of 6 districts: Chau Thanh, Cho Lach (now part of Ben Tre Province), Tam Binh, Binh Minh, Sa ?ec and Lap Vo. In 1961, Cai Nhum District was split from Cho Lach. ?uc Ton and ?uc Thanh Districts were added in 1962, but joined the newly-formed Sa Dec Province in 1966. As of 1975, the province had 7 districts: Chau Thanh, Cho Lach, Tam Bình, Binh Minh, Minh Duc, Tra On and Vung Liem. After the fall of Saigon and South Vietnam was reunited with North Vietnam, the new government merged Vinh Long with Tra Vinh Province, forming Cuu Long Province in 1976. In 1991, Cuu Long was again split into Vinh Long and Tra Vinh. At the time of the split, V?nh Long Province consisted of one city and 5 districts: Long Ho, Vung Liem, Bình Minh, Tam Binh, and Tra On. 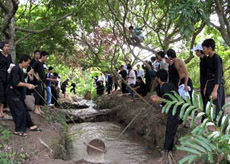 Others, Vinh Long is lush and heavily cultivated with both rice and fruit orchards. It is crossed with canals and tributaries all which flow into the teeming rivers that form its borders and while most people choose to stay here to enjoy just the feeling of a crossing the river, those with the time can visit the surrounding countryside. It is really well worthwhile.